Applications for the 2019 Award are now open to all Victorian secondary schools, and close 5.00 pm AEST Wednesday, 10 June 2019. Details here. 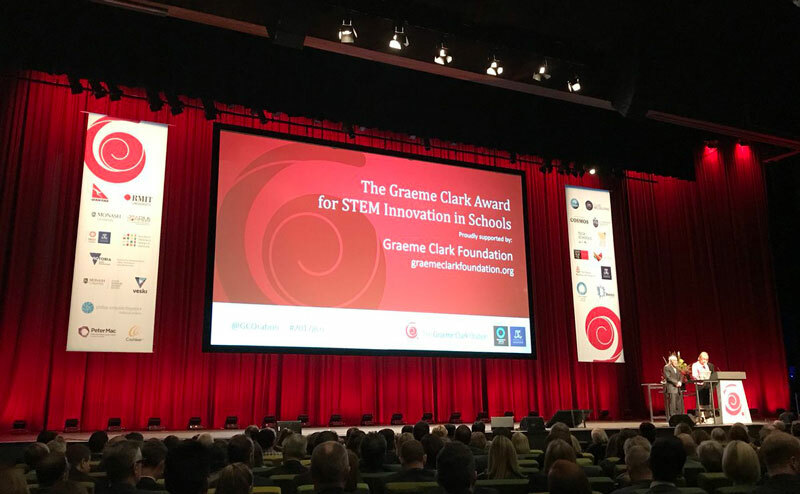 Established by the Graeme Clark Foundation, the Graeme Clark Award for STEM (Science, Maths, Engineering and Mathematics) Innovation celebrates and acknowledges science innovation in Victorian schools. Showcase your school’s innovation in science and apply today. You can read the criteria and application details here. Send your application BEFORE 5.00pm Wednesday 10 June 2019. The winning school will be announced on Monday 22 July at Australia's most prestigious free public science event that will be attended by over 600 Australian eminent scientists, academics and politicians – The Graeme Clark Oration. This is your school’s opportunity to join past award winning schools – Maffra Secondary College, Parkdale Secondary College College and Casterton Secondary College. You can help more schools engage in the sciences and further our mission “to enable individuals with deafness and other sensory disorders to develop their true potential through biomedical, technological and educational measures”, by donating here today to the Graeme Clark Foundation.